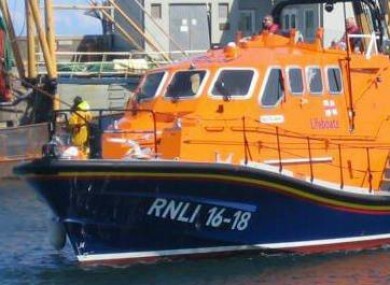 Patrick Barry was reported missing yesterday after his vessel was found near Kilmore Quay. THE SEARCH FOR a lobster fisherman missing off the coast of Wexford has been called off for the night, with the effort due to begin again at first light tomorrow morning. The man — named locally as Patrick Barry, and aged in his 50s — was reported missing at 12.40pm yesterday after another fisherman found his vessel, the Lenora Jacinta, south of the Great Saltee near Kilmore Quay. A coordinated search effort was launched, and continued today before being called off due to fading light. RNLI vessels from Fethard, Rosslare and Kilmore Quay all took part in the effort, along with ‘numerous’ local fishing vessels, an Irish Coast Guard spokesman confirmed to TheJournal.ie. Garda and naval divers also conducted searches in the area today, while coast guard units from Fethard, Rosslare and Kilmore Quay carried out low-water coastline searches. Email “Search for missing fisherman called off for the night”. Feedback on “Search for missing fisherman called off for the night”.